Jason Bourne Redux? Not even close. 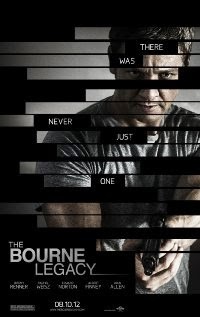 The Bourne Legacy goes in a different direction with its newest film and a new “Bourne”. Jeremy Renner stars as Aaron Cross an operative who is in the program but he's very different from Jason Bourne. He has not lost his memory, he is fully aware of who he is and who he used to be, a regular guy who joined the army but his recruitment officer fudged his IQ on the application leading him to be chosen for a new program. Outcomes who not only can blend in but are given pills which have enhanced their brains and their bodies. When some suits at the government headed by Edward Norton decide they need to shut the program down and eliminate everyone including all the agents, Aaron escapes and goes to find the doctor (Rachel Weisz) who has been supplying him with the pills. After a mass murder at the pharmaceutical plant where she works Aaron swoops in and saves her when they come to clean up the job in search for more chems. He is fully aware that not taking them will cause his psychical abilities to return to normal but also he will start losing his brain function and end up worse then where he started. Because of the premise there is a very different feel here. Sure there's some of the Treadstone people from the first 3 films but they aren't important, this movie is about another set of outcomes that are genetically enhanced and deemed slightly more controllable but this is the government that when they figure out what Cross is up to they go and pull back the curtain to tell you there's yet another set of outcomes these are also enhanced but have been taking emotion suppressors. Lethal ordered killing machines. I like Jeremy Renner in this, he's a different type of character in a role where he seems to understand exactly how he's not Bourne and never was but he is part of a different set of people who do what they do for the government but he has a secondary goal. His life - smarter, bigger, faster is better to him now and he doesn't want to lose that. His end game is about preserving himself above all else. Director Tony Gilroy who moves from writing the previous versions really tries to set a tone and a different direction with this film. You have to look at it like the Bond franchise, each movie is independent of each other (most of the time) and you need to treat this as the same. I give this movie a matinee. Its good and entertaining, the plot holes are tiny, the locale of using Thailand is a nice change for the series and I could see Jeremy as Aaron Cross for another 2-3 films. I’m not sure where they would take it after the ending of this but his casting is a great addition to the franchise. The Bourne Legacy runs just over 2 hours and is Rated PG-13. It opens Nationwide August 10th.